counseling, internet, speech language pathology. Introduction: The process of education of a patient aims to improve knowledge and skill of the patient and/or family, in a way to influence attitudes and behaviors needed to maintain or improve health. Must be a integral part of interpersonal communication between health professionals and patients, and this can happen through interpersonal communication and various other means such as pamphlets, manuals and, more recently, computer resources. Goal: This update article approach the patient education and the internet potential for this process, still presenting some initiatives in the audiology área. Discussion: The informations, related to health are popular in the internet, and include interactive websites, portals, e-mails, telehealth aplications, and others. The education of the patients supported by the internet can help to solve a big ethical, political and economic issue: the problem to conciliate the needs and the expectations of the patients with the characteristics and limitations of the health system. Although the use of internet in the education of the patient is promising, this is not a solution to be used without careful planning, monitoring and evaluation. In audiology there are few initiatives with the use of e-mails and websites for complement of the patient education. Final Considerations: The health professionals, including the speech therapists, must check if their patients use internet resources, recognize that behavior change and prepare not only to discuss the information obtained with the patient, but also suggest websites with reliable information and help them to evaluate the quality of the information available online. In the decades of sixty and seventy the health professionals were responsible by diagnosis, treatment and accompaniment of the patients, being the last ones considered passive participants in the process of the diagnosis and decision making in the treatment. From the decade of eighty many countries established laws that give the patient the right to know about his health conditions and opine about the treatment. In the nineties the patients have become to be actively involved in the promotion of their health, sharing with the health professionals the responsibility for treatment decisions and their goal, in a more egalitarian dialogue in the place of a paternalistic model. Besides, the influence of people in the convivial of the patient like spouses, sons and others members of their social network, was recognized as important in the intervention process, being even incorporated as a system of support. This time, it was pointed out in a major way the importance of self regulatory behaviors, in their daily life, in results of treatments what, consequently, led to a greater concern with the process of education of the patient (1). In this context, the education for the patient is understood as part of the treatment that allows a critical review of the traditional relation professional-patient, focusing the personal and emotional aspects and the recognition of the need to centralize the person and not the disease (2). The main objective is to allow the patient to make conscious choices about managing their condition (3). In some way, all health professionals give to the patients or/and family information about their condition and treatment, secondary prevention and possible complications. This can occur by means of interpersonal communication and/or different means like flyers, manuals and, more recently, computational resources. The advances in information technology, computation and communication transformed the economic life, social and cultural of society. The computers, more than tools that make people's life easier, have become part of the culture (4). The computers and internet make it possible to obtain information in different sources, local, schedules in a unprecedented speed, and because of that the great impact in the process of education to the patient. This article of actualization approaches the education to the patient and the potential of internet in the process, still presenting, some initiatives in audiology. The activity of education of the patient has received different denominations, not having a terminology frequently used in the phonoaudiologic literature or even in other health areas. Often the terms counseling, orientation and education for the patient are employed as synonymous. This scenario can lead to misunderstandings of professional practices. The counseling is a opportunity to receive and provide information in a way to make easier the understanding of a health condition and provide adjustment to this situation. Two kinds of counseling are defined in literature: (a) counseling of personal adjustment, that involves the development of mechanisms and systems of emotional support to the individual to deal with the situation, and (b) counseling information, that approaches questions related to a determined disease, normal physiology, exam results and plan of treatment (5). The term "orientation" is frequently used in the place of "Counseling Information". The Federal Counseling of Phonoaudiology use the terms "orientation" and "counseling" to refer to one of these areas of competence of speech therapists which includes professional actions of listening, the explanation, instruction, demonstration, proposition of alternatives and verification of effectiveness of the proposed actions and understanding of given orientations (6). The term "education for the patient" refers to all educational activities directed to the same, including aspects of therapeutic education, health education and promotion of health. The process of education to the patient has as goals improve the knowledge and ability of the patient and/or family in a way to influence the attitudes and behaviors needed to maintain or improve the health (7). The therapeutic education is defined like a process to help the patient to acquire or maintain the needed competencies to deal with the best possible way with a disease in his life. It is, therefore, a continuous process, integrated with health care. Is centered in the patient and includes: attention, information, learning self-care and psychosocial support about the disease, prescribed treatment, about the hospital or others health institutions, organizational information and of behavior related to health and to the disease (8). The rise of therapeutic education as a study area, that indicates the signs of decline of dualistic and reductionist biomedical model in favor of a biopsychosocial model with a systemic perspective. Attention is given to the concept of health and no more of the diseases, shifting the axis around which revolves the clinical intervention, of disease to welfare. The protagonist it is the individual itself that acts to improve its health (2). The presupposition that the patient is the active agent in the process, the term "education to the patient" is used in this article. The benefits of education to the patient can include some or all following items: bigger knowledge of disease and understanding of the circumstances of these to each patient, better comprehension of the need of the treatment, better communication between the patient and the health professional, participation of the patients in the choice of treatment, development of opinions and appropriate models about the disease, improvement of self-care, improvement in the crisis management, development of coping skills and solution of problems, emotional welfare, improvement in life quality, greater awareness of the importance of follow-up visits and/or need of more screening procedures and diagnosis, better agreement with the plans of treatment, better use of time and resources (3). Some chronic diseases raise the questions in relation about the state of health to the patient and family. May have important consequences in the way how to deal with the daily life like, for example, the need to ingest the medications, use of prostheses or conducting periodic health examinations. These factors lead the patient to a cognitive restructuring of self-perception, an "I" that may have suffered considerable physical changes and the organization of a new identity, recognizing the state of "being sick". And so, the education of the patient is also a therapeutic tool and require a profound sensibility related to the aspects of interpersonal relations, individual needs, expectations and real possibilities of recovery and rehabilitation (2). Stands out, however, that not always the information considered essential by the professional is the one that the patient considers necessary (9). This way, is important that the professional reflects about their attitudes and opinions about knowledge, learning and education as part of the patient treatment. "The patient is treated as a partner in the learning of the student? There is dialogue with the patient to know the needs of learning and ideas or it is just a communication of one hand street with standard material?". There are no learning without reflection, interaction, understanding and efficient interpretation by the patient (10). The process of education to the patient can be described in five steps. The firsts includes a evaluation of previous knowledge that the patient already have, misunderstandings, skills and styles of learning, cognition, attitude and motivation. This can be collected through interview or specific tests. After this evaluation, the resources of the patient, the objectives are defined and the interventions are chosen. In the planning phase the method used to education, who will provide it, the frequency like and when the education will occur will be defined. The next step is the supply of education, and the last the evaluation. From this, the continued evaluation of the patient needs and his objectives provide the basis to more education (11). The location chosen for the education to the patient can be in a hospital, an ambulatory, and units of primary attention, the residence of the patient or even the combination of all of these locations. The process of education begins in the primary attention or in the hospital, depending on where the patient was diagnosed. Once the patient receives education in different moments and of different professionals, the content must be consistent in the chain of care, in other words, the information must be clear and not contradictory in order to achieve a greater agreement of the patient to the treatment (10). The Technologies of information and communication are present in most of the areas of human activity, including the health area. The dissemination of use of internet has provided a strong increase of the access to information with benefits to education and to the patient. The internet it is a global network of computers interconnected by a specific protocol that not only allows the access to information, but also the transference of data from a computer to another. In December of 2010, about 1,9 billion of people had access to internet, a global penetration of approximately 29%. The rate of users has grown about 445% between year 2000 and 2010. The Latin America and Caribbean count with 200,1 million of users, being 75,9 million of users only in Brazil (12). The Center of Studies about Technologies of Information and of Communication in Brazil has interviewed 19.998 people in urban and rural area in the period of September and November of 2009. Collecting information about the use of internet. 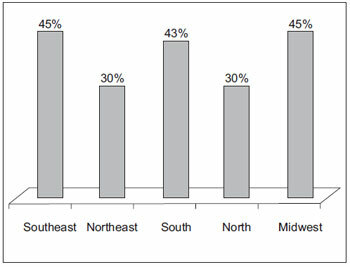 The percentage of individuals with access to internet in this period is found in Image 1 (13). The information related to health is popular in internet, and include interactive websites, portals, e-mails, telehealth applications, online communities, games and simulators. The websites with health information are the most visited - it means that the patients are collecting information out of the traditional interaction with the health professional (1). There is in this way a decentralization and democratization of the access to information, with possibility of the information to be reviewed many times as the patient think is necessary. The internet also provided a useful source of information and support for a wide range of chronic conditions, provides convenient forums to many persons, avoiding many conventional obstacles to support the participation in groups like, for example, time, geographical location, personal and physical barriers (3). The education of patients supported in internet can contribute to solve a great ethical challenge, political and economical: the problem in conciliate the needs and expectations of the patients with the characteristics and limitations of the health system. Computers can help in the process of democratization and dissemination of information about health and allow to, through knowledge, individuals, families and communities take over a role more active in the care of their own health, minimizing the psychological burden facing treatments, exams or surgeries, as decreasing the use of costly and unnecessary services (14). A systematic review with twelve studies about subjective experiences of patients that used the services of the health interactive communication showed that the use of such applications in internet increased the knowledge, the trust and improved the health of such patients. This, on the other hand, allowed to be narrowed the relations patient-health professional (15). In relation about the habits of Brazilian patients about the use of internet, 83% searched information about health in the web and 85% go back to do researches online after medical appointments. The patients revealed that the information obtained in the internet were useful and that made them more active in relation to the decisions of their health. More than 50% of them that do researches for information of health in the internet use the Health Only System (16). The popularity and the growth of information about health available in the internet show new challenges, like, for an example, the quality and objectivity of the presented information. Many instruments of evaluation have been developed with the purpose of guiding the consumers to good sources of information. These instruments are usually generic, and so can be applied to websites that provide different information for a series of health conditions. The measurement of the clinical impact and the capacity of consumers to learn the content found online, also should be considered in the evaluation of a website (17). In Germany was observed how people search through internet about issues related to health and how they evaluate the found information. The most of individuals used seekers like, Google. Was observed that 97,2% analyzed only the first ten results and afterwards they made a new research. The participants used the following criteria to evaluate the quality of websites: source of information, appearance and layout of the website, readability, existence of links, contact provided, authors qualifications, upgrade of content and seal quality provided by some agency responsible (18). -Qualification of the authors: any orientation of health offered in the website must be provided by trained and qualified professionals. -Complementarities: the information provided must help, not substitute, the relation medic-patient. -Privacy: must be respected the privacy and confidentiality of personal data that the users or the visitor send to the website according to the legal requirements of the state or country where the website was developed. -Attribution: must be mentioned in the consulted bibliography and/or the source of provided data in the website and, if it have, must be provided the links to such sources. The data that each page is modified for the last time must be provided in a clear way. -Justifications: any affirmation made about benefits and performance of a determined treatment, commercial product or service must be sustained by evidences. -Transparency: the information must be presented in an accessible form. Must be offered a contact form to the visitors that want information or additional help. -Sponsorship: the sources of funding must be identified. -Policy of advertising: a brief description of the policy and adopted disclosure by the website has to be presented. The National Center to Complementary and Alternative Medicine (20) also provides a guide to the users of internet to evaluate the websites with information of health in agreement with ten basic questions: 1. Who is the responsible for the website and for the information in it? 2. Who sponsor the website? 3. What is the purpose/objective of the website? 4. Where come from the information provided in the website? 5. What are the references and information? 6. How was selected the info? In other words, there is editorial board? The content was reviewed by professionals with scientific qualifications? 7. How updated the information is? 8. How the website choose the links for others websites? ( A few websites pay to have their links in other pages; others establish some criteria to put the links?) 9. Which information that the website collected and why? 10. How the website administers interactions with their visitors/users? A study compared the usability of different instruments to evaluate the websites of health. The researchers asked that five participants entered in the website "Internet Health"and assess via administration of three different instruments translated to Portuguese by the authors: (a) Emory (22), 36 items divided in the content scales, precision, authors, actualizations, public, navigation, links and structure - presents a easy punctuation and padding; (b) Michigan (22), 43 items divided in content scales, precision, authors, actualizations, public, values, navigation, links, publicity and structure - presents an easy understanding, although, it is of difficult punctuation; and (c) the HonCode adapted to Portuguese (23). Were evaluated the time spent and the result obtained by the application of each instrument. The comments of the participants about the use of the instruments were analyzed qualitatively. The average time of application of the instruments was of 2,2 (HonCode_, 11 (Emory) and 13 minutes (Michigan). To each instrument used was observed the variability of punctuation interrater, being this bigger than the Michigan questionnaire. There was discrepancy of the result of the evaluation between instruments, in other words, the website was considered appropriate for the Emory and HonCode instruments and weak by the Michigan. The obtained classification for the application of the instrument not always corresponded to the subjective judgments of quality of the website given by the evaluator, especially in the case of HonCode. The Michigan questionnaire was considered difficult to understand and too long. The Emory was considered the most faithful in the classification of the website and the one with easiness of understanding of the questions (24). -Usability: considers the different ways of use, during development phases and of use. To the developers must be guaranteed that the related activities to the development and maintenance can be performed with easiness and quality. To health professionals, guarantee that the system have appropriate characteristics to the users (the patients) and that, emerging the need of alterations and/or of introduction of new information, they can be performed in a timely manner with acceptable cost, maintaining the desired quality. To the final user (the patients) the quality attributes related to this goal refer to related characteristics to easiness of system use and the satisfaction of the user into using it. -Conceptual reliability: evaluate and guarantee the reliability of the available content. The information provided cannot present errors, because, otherwise, can lead to undesired consequences to the health of final users - the patients. -Reliability of representation: for a system of education to the patient to attend the objective of complement or, in specific cases, substitute the given information by health professionals is necessary that they are represented in a way to facilitate the understanding. A literary review identified four main points for the use of technology of information and communication to reach its full potential to educate the patient. The interventions based on the internet must be developed in a way to maximize the interactive communication with the users, in order to encourage their active involvement in the promotion of health. The systems have to be designed to work in a effectively and transparent way in different platforms of communications and with different populations of users. The interventions should be designed to engage the interests and emotions of the users to promote the maximum exposition and influence of the posted information. Finally, the applications should be developed to have a wide access for many populations and, at the same time, adapt to the needs and specific interests of different users (26). Figure 1. Percentage of Internet users by region of Brazil (13). Although the use of internet to educate the patient seems promising, this is not the solution that should be used without a careful planning, monitoring and evaluation. The technology should be used as a way to get to the purpose and not as the purpose itself. The five steps of the process of education described by RANKIN and STALLINGS (11) can be applied when you plan a material of education based on the internet. One of the first considerations about the use of internet in the process of education for the patient is about the access of them to internet as well as the costs involved. It is important to know if the patient has or have access to a computer, if it knows how to use them and if it has interest into using this resource to obtain information about health. Although the use of internet keeps increasing, there is a gap among the people with effective access to digital technologies and information and those with little or none access - in the last case people with less instruction, lower family gain, with age above 65 years and that live in rural areas (4). Another issue of great importance is the very limited control of information that is inserted in the web. The worry of many professionals is that the patients take important decisions about their health in information that have not been reviewed in the terms of their quality, objectivity, present, accuracy and absence of biases. It is noteworthy that it may have other interests, like, economic, behind the provided information (7) so there is the importance of the evaluation of the websites. The evaluation of health websites brings benefits, among them, promotion of improvements and quality, use and effectiveness of the website, decrease of possible negative effects, conservation of resources and participation of potential users in the process of development of the website. The evaluation can be done befone the development of the website, during and after the disclosure of itself, ensuring constant actualizations and improvement of the presentation (27). Besides the evaluation of quality of the content it is of extreme importance the measurement of the clinical impact and the capacity of the consumer itself to learn the content found online (17). Not all existent information in the web is easy to understand. Besides, it may be that the number of existent information is bigger than what the person can deal with. Like, a individual in initial state of diagnosis can find information about the pathology course. This way it is important that the professional ask the patient if they are using the internet to explore the kind of information found. Some patients do not feel comfortable into revealing that they search for info in the internet with the fear of that it may shake the relationship between him and the professional, in other words, the professional understand this as a lack of trust in the care received. Many patients perform searches through the internet about their conditions of health and of members of their families before search for the health professional. This way, the patients will have a previous notions, truthful or not, about the diagnosis and treatment. So, it is necessary a change of conduct of the professional to deal with these patients, assuming a more open attitude, capable of work the information found by the patient and indicate sources with a higher fidelity, leaving so the old authoritarian attitude (28). Was performed a review of studies examining how the searches of internet made by the patients affected the relations with the health professional. In a general way, three types of results were found: (a) the professionals felt threatened by patients that bring information obtained in the internet and react defensively offering their "specialist opinion"; (b) the professional and patient act together to find and analyze the information and (c) the professional guide the patient to more reliable websites (29). The use of internet as tool to help the process of education to the patient has been discussed in different areas of health, mostly in nursing, medicine, psychology, nutrition, pharmacy both nationally and internationally. In terms of phonoaudiology, there is in the internet a high number of websites with information referring to many process and disorders of communication, being these developed both for scientific societies and companies that work in the area. However, till the present moment, studies that evaluate the quality, content and use of such websites to educate the patient are extremely rare. KALDO-SANDSTRÖM, LARSEN e ANDERSSON (30) evaluated the effectiveness of therapy of cognition-behavior applied through a website of tinnitus treatment. The participants completed weekly modules and at the end of every session, they completed a journal in the website itself to monitor the progress. Was observed a significant reduction of stress, anxiety, depression and insomnia to those that completed the program. The rate of desistance of participants was of 30%, being this one higher than the one observed in the face to face treatment. However, there were no difference between the judgment of credibility of treatment applied traditionally by internet. In Brazil researchers evaluated the efficacy of the website "Baby Portals - Phonoaudiology" as a instrument of orientation by distance to the parents of children with hearing deafness users of HA in a preliminary study. In this study participated 31 parents of hearing impaired children newly adapted to HA, divided into group A (n=18) and B (n=13) that received presentable guidelines about the characteristics of hearing impairment and the use and care with HA. The B group accessed the website during the first months of the use of HA. Was applied a closed questionnaire about the provided guidelines immediately after the adaptation to HA and in the first return of the child. Both groups recognized 83% of information about the characteristics of hearing loss in the moment of adaptation or return. Regarding the use and care with HA the participants recognized 89% (A) and 85% (B) of information in the adaptation and 77% (A) and 94% (B) in the return. In the performed evaluation in the return, the B group recognized a significant higher quantity of information than the A group. The authors could conclude that the programs of orientation to parents of hearing impaired children that allow convenient access to the orientation provided, are necessary to help them in the retention of information and, consequently, assure the effective use of HA (31). The use of the internet as a source of information about health has become more and more popular. The health professionals, including the speech therapists, should check if their patients use such resource, recognize this change of behavior and get ready not only to discuss such information with the patient, but also suggest websites with more reliable information and help them to evaluate the quality of the information available online. Also is of great importance that the speech therapists to participate more actively in the development of websites that help in the process of education of the patient having as base to the creation of content the needs and prospects of users, the principles of quality as the possibilities of interaction offered by the internet 2.0 or web 2.0. This term identify the change to a platform internet, where the applications take advantage of the network effects to become even better as more and more used by people, enjoying the "collective intelligence". The user is active, in other words, not only enjoy, but also contribute. The classic example of web 2.0 is the Wikipedia where each user has the possibility of reading and adding information freely. The individuals that search information of health in the internet can use the same tools in the web 2.0 to share not only information, but, especially, their feelings and experiences of "being sick", to, this way, give meaning to the troubled time they live; to share their experiences, their anguish and their sufferings of getting sick with others, and to built knowledge about their health problems, allowing themselves to feel safe and confident during treatment which they are submitted (32). Finally must be remembered the education to the patient based in the internet still it is a new field of research for Phonoaudiology, itself must be used as a way to complement and not substitute the education provided in a presentable way. It is indispensable the realization of randomized studies and controlled to evaluate the effectiveness and efficacy of the process of educate the patient through internet. 1) Speech Therapist graduated from Dental School College of Bauru - University of São Paulo (FOB/USP). Master's Degree in Phonoaudiology - FOB/USP. 2) Doctor in Neurosciences and Behavior - Institute of Psychology of University of São Paulo. Professor Doctor from the Phonoaudiology Departament of Dental School College of Bauru - University of São Paulo. Source of Research Assistance: Research Support Foundation of State of São Paulo - Fapesp- Process: 2008/07963-0. Article received in February 1st of 2011. Article approved in May 21st of 2011.